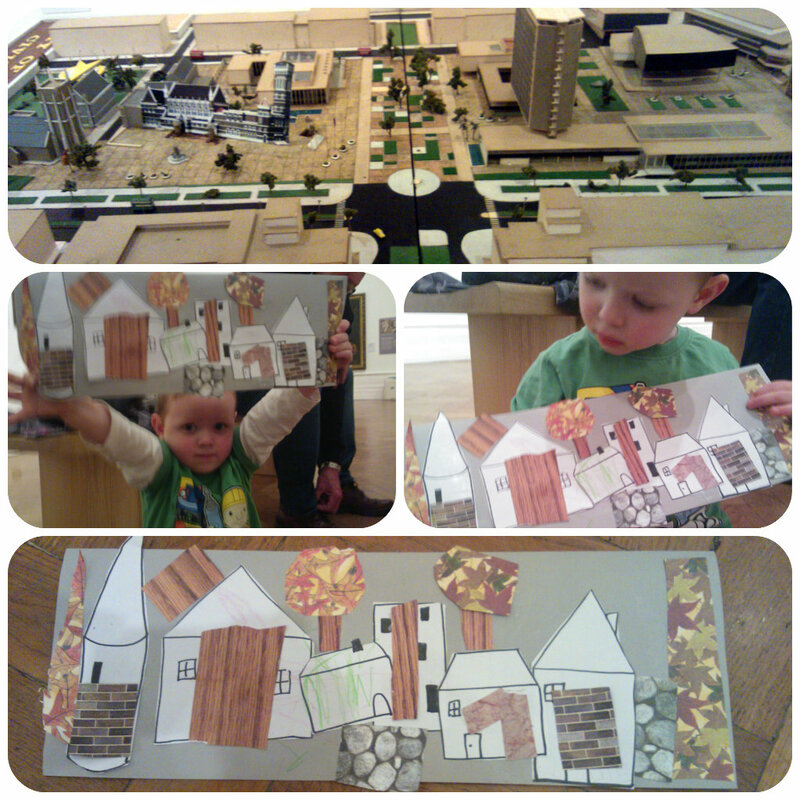 This week at Mister B’s craft group at the local museum we did collage, one of his favourite things. There’s nothing more he likes than getting a glue stick and sticking things on. His interest in crafts has really grown over the last few months and he takes an active interest in the things we make each week, more so if a glue stick is involved! 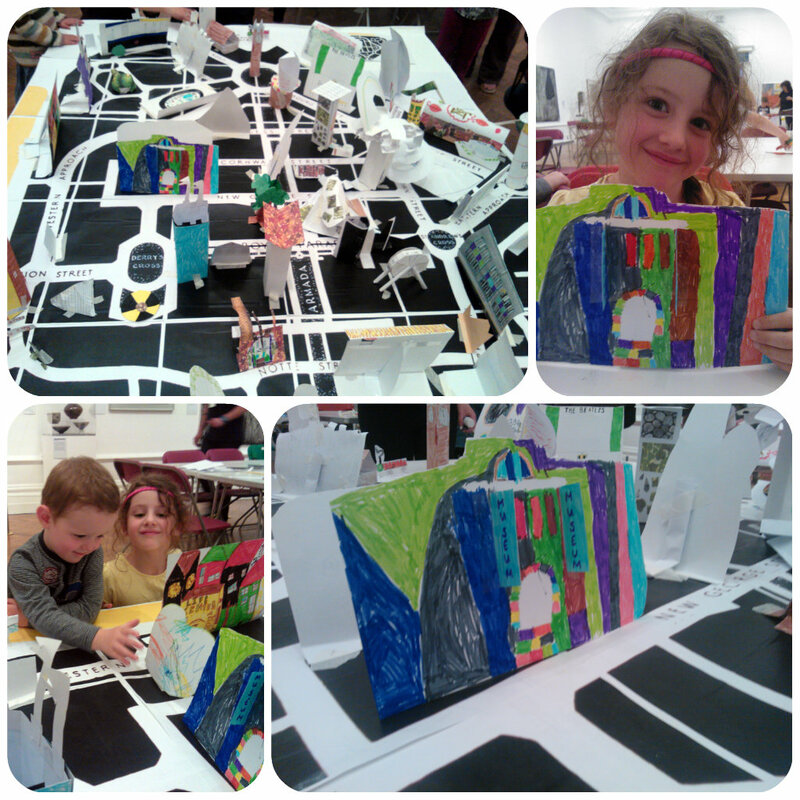 The theme this week was to create a street scene with inspiration from a post war model of the city’s civic centre area that was displayed in one of the museum’s galleries. We cut out some building shapes out which we stuck onto our background. Then used some cut up shapes from patterned papers to add interest to our design. Once everyone had finished we lined up all the pieces along the floor to create a long scene of buildings and trees and stood back to admire all the children’s pieces of art side by side. Mister B really enjoyed this weeks project and put lots of enthusiasm into his work. 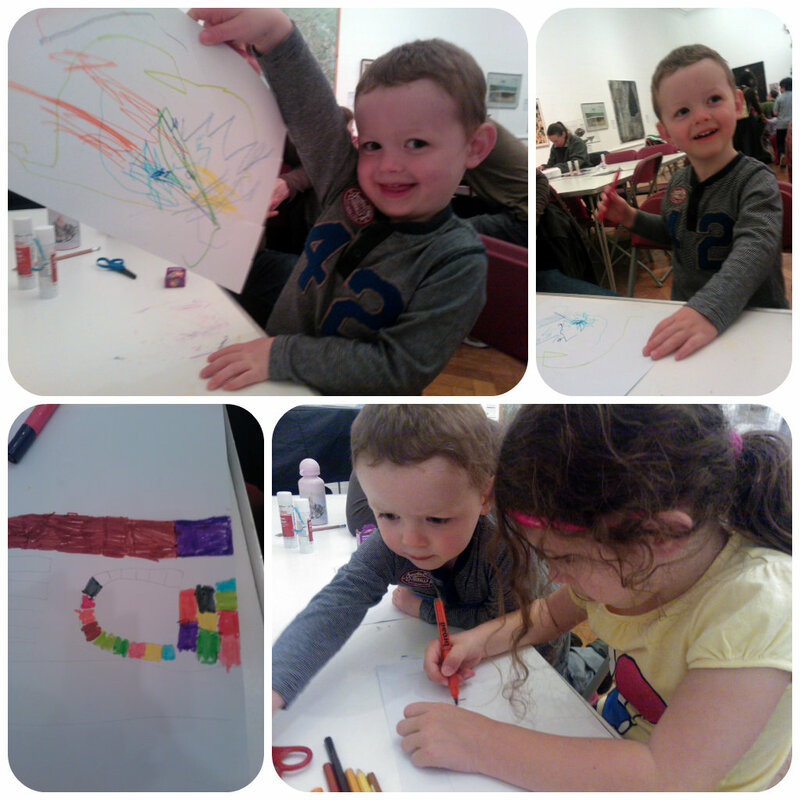 Another successful week of artwork at the museum – we look forward to going again soon. 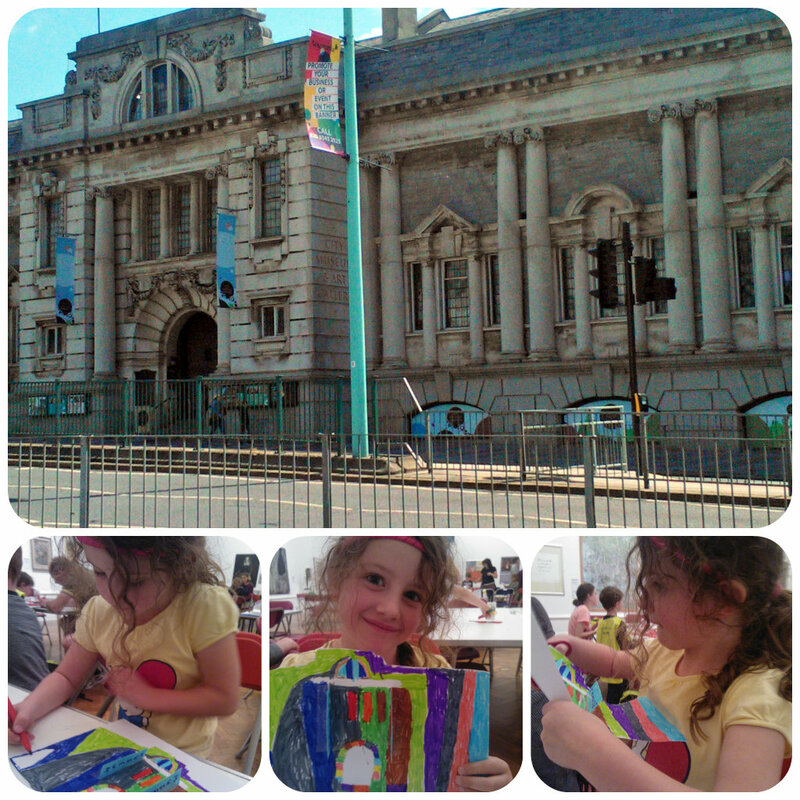 For a half term activity we decided to go to the local museum’s craft morning. The theme took inspiration from one of their current exhibitions “The Making of a Modern City” which shows the plans, documents and photos of the rebuilding of the City Centre following the heavy bombing it suffered during World War II to show how it became the city it is today. In one of the galleries, lots of tables were set out with a huge road map of the city centre laid out on a centre table and the idea was for each child to make a building to place on the map. It could be of any design and as creative as the child wanted. My two sat down and started drawing and were really excited of the thought of making something that they could stick on the big map. Mister B was very proud of his creative masterpiece while Miss M went into deep concentration as she set out to replicate the museum in a modern colourful design. Miss M was so pleased with her finished interpretation of the museum and couldn’t wait to stick it onto the central map. There were lots of wonderful designs on the map by all the children, some in 3D, some of replica buildings of the city and others just purely imaginative. What a lovely way for children to be creative and bring their designs together. The map will be displayed in the central foyer of the museum for the rest of this week and over the weekend for visitors to enjoy. It’s so nice for the children to have their work displayed alongside all the other displays, exhibitions and artwork that is in the museum – it gives them a real sense of pride. Dinosaur crafty fun with clay!! The theme at Mister B’s museum group this week was dinosaurs, which he was rather excited about. We started by looked at some old dinosaur fossils and feeling their textures before getting on to the messy task of clay! Unfortunately Mister B prefered to prod the ball of clay with the plastic crafting tools rather than get his fingers stuck in and then ordered mummy do create the body of his dinosaur although he did eventually join in adding bits along the back and to the tail. Then he used his tools to add some texture to the side of the dinosaur. We were given a black and white picture of a dinosaur head which Mister B loved colouring in and after sticking it to a lollipop stick we poked it into the neck of the dinosaur to finish it off. While we left the dinosaurs to dry we played with some dinosaur themed toys. 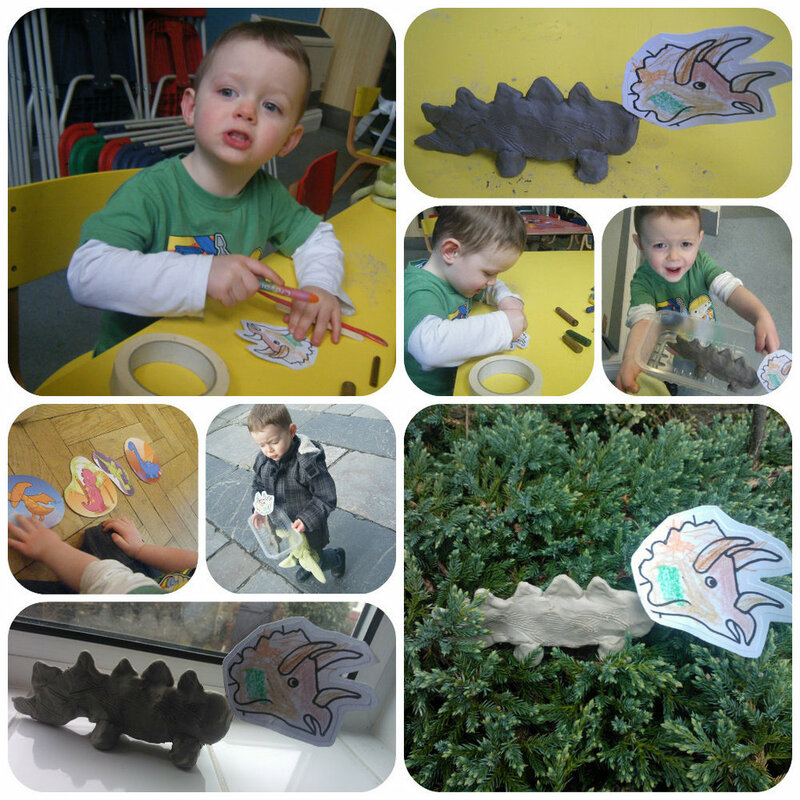 Mister B really enjoyed the dinosaur puzzles which he completed all on his own. He’s never had much interest in puzzles up to now but seems to have suddenly found a real fondness for them which is great for his hand eye coordination and we have plenty at home for him to practice with. Another fun filled week at the museum over and one happy little boy proudly carrying his finished masterpiece out the door of the museum and down the road!! Mister B’s crafty sailing boat! At Mister B’s art group at the local museum this week the theme was boats. We walked around the exhibition displaying various ships and vessels from years gone by and I have to say Mister B loved it. He was pointing out all the flags and other parts of the ships he recognised and even found a huge boat that he decided was a pirate ship!! We then went back to the crafty room to make a boat picture make up of coloured paper stuck on to a boat outline. 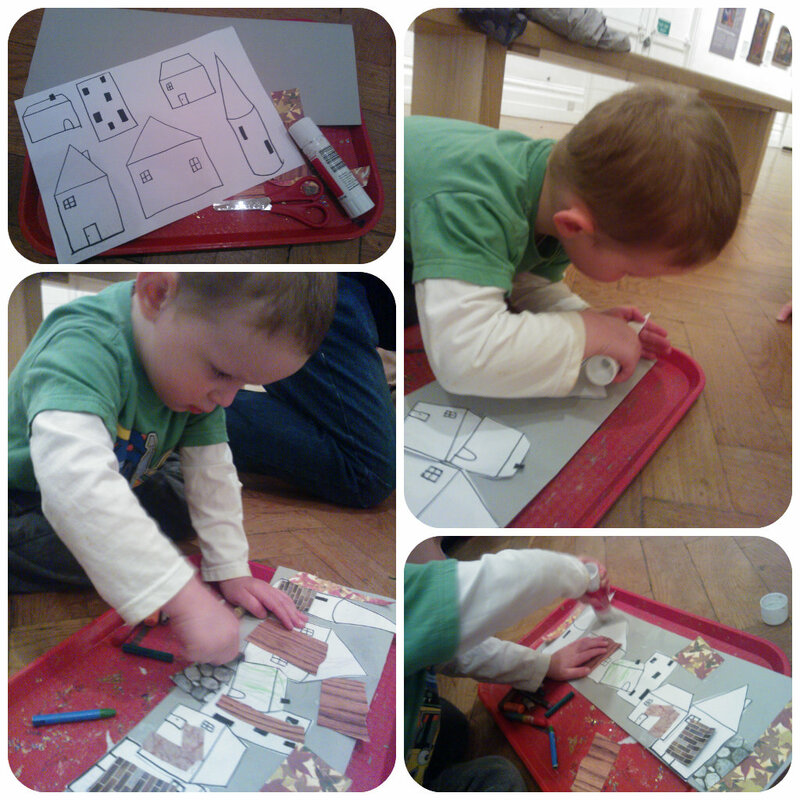 He thoroughly loved getting his fingers mucky with the glue stick and pressing down the paper shapes. And then all the children in the group proudly walked around the ground floor of the museum showing off their boats – so cute!!. I’m so pleased that Mister B’s crafty side is coming out as he wasn’t so keen at first unlike his big sister who is the crafting queen of the house!! 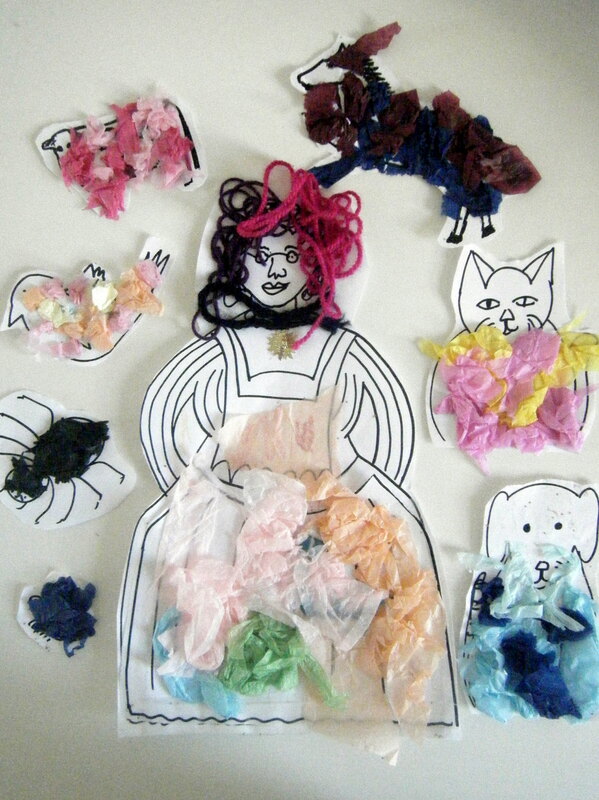 There was an old woman who swallowed a fly… museum crafty fun! We go to a wonderful under 5’s group at our local museum every week. There is a different theme each week where we look at a display or some objects around the museum and then make a crafty item that links in with the theme. It is a really interesting group that allows the children to experience something new along with some fun in making something (usually with glue/tissue paper/sequins/glitter etc) and then stories and songs at the end to calm them down and bring the session to an end. Miss M loves attending and we have made some wonderful things over the last couple of years. We were given basic printouts of the lady and all the animals she swallowed which we had to cut out and decorate. We then added an extra layer to the front of the skirt to make a pocket to keep all the animals in. So here we have our finished lady!! Poor Mister B spent most of the hour stuck in his push chair or when I did let him out, he was caged in my arms!! If I dared to let him go he sped across the floor on his knees grabbing a multitude of coloured tissue paper that he had his beady eye on and chewed it up. Hopefully in a couple of months he will understand what he can and can’t eat and it will make things much easier.